Throughout the four months of training, we often give you a behind the scenes look at the fight journey. Weekly routines, daily sacrifices, and the underlying motivation that drives each fighter to step into the ring. What you don’t often see or hear about are the people behind them - their trainers. From former pro boxers, to seasoned instructors who have grown up around the sport – these dedicated coaches are part of the lifeblood of Haymakers. They teach their students the art of the sweet science...how to punch, slip, move around the ring, and achieve an optimal fitness level. 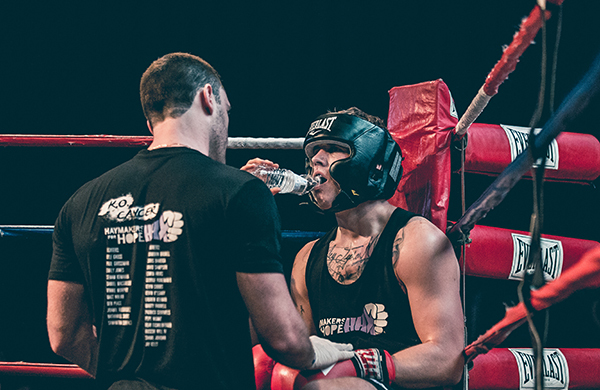 Their passion for boxing and Haymakers mission to KO cancer is the real reason our fighters come fully prepared for their first amateur bout on fight night and we wanted to share a bit more about those who are in our fighters' corners. 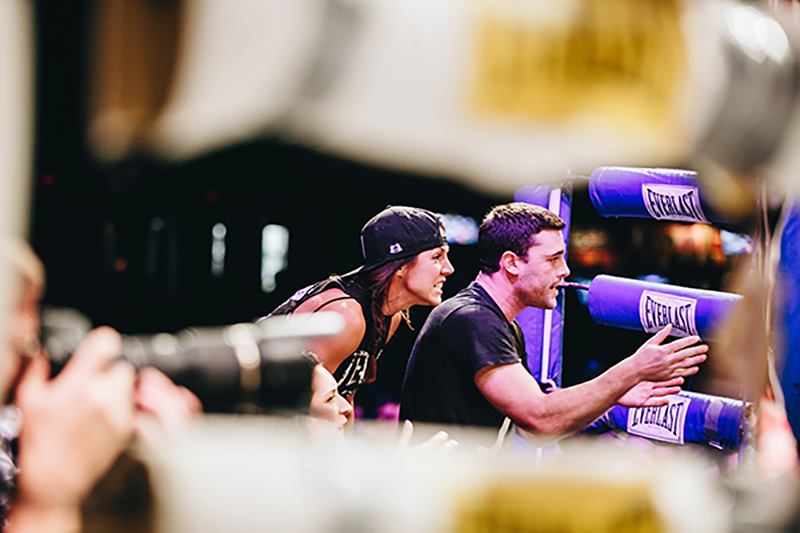 Below you’ll hear from Kevin O’Leary, a coach at EverybodyFights in Boston who has trained fighters for Rock ‘N Rumble and Belles of the Brawl. How long have you been coaching Haymakers fighters? How did you get involved in boxing? I got involved in boxing during my junior year of college. I was at the South Boston parade and saw a man in his 40's sitting on his stoop with a puppy. Being a dog lover and a little tipsy at the time, I approached and started playing with the dog. At the time, I had a cast on my hand from an unfortunate decision made some weeks before. The man told me his name was Joey DeGrandis, a former professional boxer from Southie. He asked me if I wanted to learn to box for real instead of making stupid decisions and breaking my hand. A month or so later when my hand was healed I called up Joey and had my first boxing lesson at the L Street Bath House. I've been boxing ever since. What was it that inspired you to become a coach? I love the sport and love to teach it to people. It instills discipline and teaches people to find another level that they didn't know they had. The lessons they learn preparing for a fight stays with them for the rest of their lives. For people who don't want to fight, it is an excellent tool to get in shape. 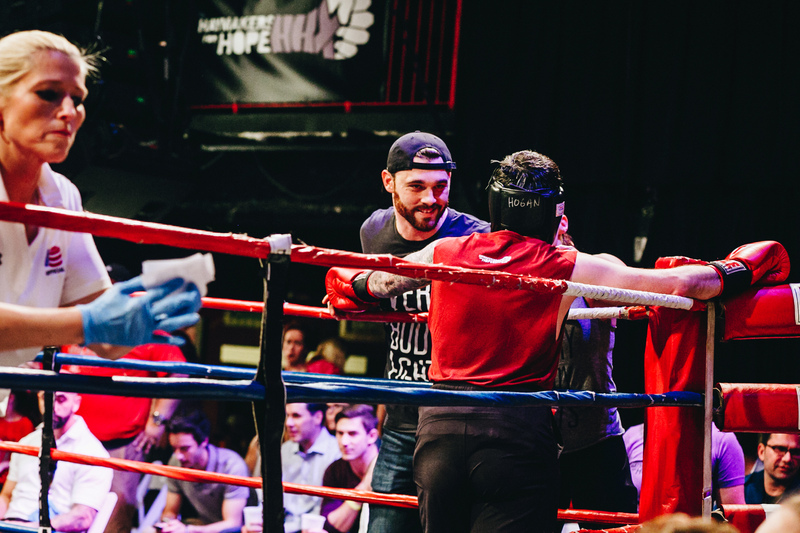 How did you first get involved with Haymakers for Hope? George Foreman III took a couple boxers at his gym for Haymakers in 2014. I started off sparring with them and getting them ready for their fights. I found I really enjoyed teaching the sport and George provided me with the opportunity to train them. It's fun. Most go through the same stages. It starts with a nervous excitement where we try to drill the fundamentals into them. They then progress to sparring where they usually start by getting their butts kicked and humbled. Once they get over the humbling experience they really start to learn and blossom. As a coach, what is the most rewarding part of training? Seeing them grow from where they started to where they finish. Each boxer improves their boxing skills but they also become mentally tougher and show themselves their true capabilities. Who is your favorite fighter? Any words of advice for current or future Haymakers fighters? Don't be a wimp (kidding, but not really)....don't put that. Have fun with it and enjoy the months of training. It will be difficult during your camp but you will miss it after the fight.